Volume 2 of his first recording as a leader after nearly four decades of performing! Known for his work with Don Cherry, Beaver Harris, Donald Byrd, Archie Shepp, Ed Blackwell, the George Adams-Don Pullen Quartet and, more recently, with vocalist Sheila Jordan and in the Grammy Award-winning ensembles of Joe Lovano, Cameron Brown is heard here —and how! —for the first time as a leader. Recorded live by renowned engineer David Baker in a concert tour of Belgium, Cam', legendary vocalist Sheila Jordan, trumpet wizard Dave Ballou, and drummer Leon Parker, Bird's alive in this house — in spirit and through his bop anthem "Confirmation" (replete with Sheila's hip lyrics, masterful scatting, and inimitably down-to-earth, Sheila-being-Sheila lead-ins), and so are Sheila's native American roots in "Mourning Song," Cam's late pioneering collaborators in "Lullaby for George, Don, and Dannie," "Soft Seas," and "Double Arc Jake," and even the Great American Songbook in Cole Porter's "You Do Something to Me." 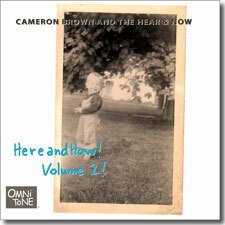 A special treat of both volumes is the chance to hear Cameron Brown as composer and lyricist. Aptly, it may in the words of "Lullaby for George, Don, and Dannie," which Cam wrote in musical mentors and collaborators George Adams, Don Pullen, and Dannie Richmond — to whom this volume is dedicated — that proves an apt description of the modest man-behind-the-music: "Brave and true they struggled, firm and pure and shining. Music is the way they transcended." Buy Here and How! Volume 2! now at the OmniTone store. Recorded live on 8 November 1997 in Gouvy, Belgium (#5); 9 November 1997 in Brussels, Belgium (#2); and 10 November 1997 in Bruges, Belgium (#1-4, 6). This recording was joint production of OmniTone and Jazz'Halo.